"We're excited to be back at SHOT Show for 2019 and proud to help sponsor the 14th Annual SHOT Show Industry Day at the Range, lane SR-42)," said Maxim Defense VP Sales and Marketing, Dave Larson. "2019 will be like no other year for us; we have a host of new and groundbreaking products releasing that we know will excite our customers and the industry." Like the Gen 6, the Gen 7 is a CQB stock built for comfort and durability for real-world use. No buttons to push, just pull the stock to deploy. At its most collapsed position, this CQB stock only adds 5.35" to your AR15. At full extension, the Maxim CQB stock is the length of an extended carbine stock. And with 4 total positions, you can adjust for maximum comfort and multiple scenarios. Rapid deployment, purpose-driven materials, and the functionality you need, the Maxim Defense CQB Stock is simply the most thought out, versatile, and durable CQB stock on the market. The Gen 7 is for those who want a sleeker profile, eliminating the side sling swivel attachment points from the housing. Instead, the Gen 7 comes with our ambidextrous sling mount already installed. MSRP starting at $369.95 and begins shipping in February 2019. A common problem in short barrel PDW's with low-pressure cartridges is reliable cycling. Maxim Defense HATEBRAKET Muzzle Booster is designed to regulate firearm exhaust gases to ensure PDW's cycle more reliably. The primary design features include the redirection of the sound signature, decreasing the flash signature, significantly reducing recoil, and increasing accuracy. The HATE BRAKE installs with a 3/8" drive socket from the front, enabling it to be installed under a handguard without removing the handguard. During installation, the HATE BRAKE locks into place with K-Taper, a patent-pending taper locking technology, replacing the need for proprietary tapered barrels. The external shape of the HATEBRAKE is designed to work with M-Slot compatible hand guards. The HATEBRAKE starts at just $199.95 and begins shipping in February. SHOT Show 2019 will be the first significant industry show displaying the patent-pending M-RAXT Rapid Attachment System. Unlike the traditional M-Slot mounting systems, M-RAXT utilizes the full slot of your rail, maximizing space. This makes the M-RAXT system end-to-end stackable, giving you the option to create seamless monolithic rail sections where needed. Installation and removal is a breeze. Thanks to the spring-loaded screws, the M-RAXT system removes mounting frustrations. Simply push the screw in with a standard hex tool and rotate 90 degrees. The locking lugs engage that readily. No more fighting or timing screws. Offered in 2, 3, 4, 5 and 6 M-Slot lengths, the M-RAX is shipping today and starts at an MSRP of $39.95. Visit Maxim Defense at booths #1857 Downstairs and #30010 Upstairs to get a first look at the PDXT and all of Maxim's products. 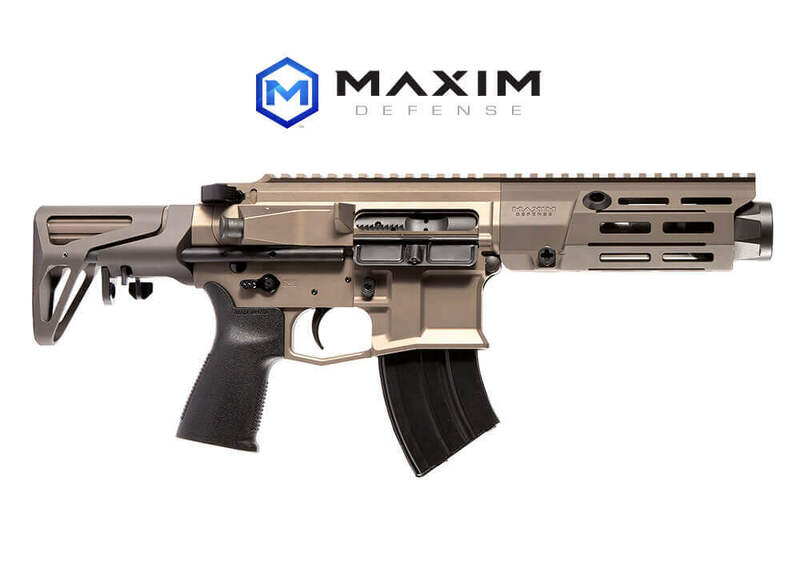 Check out Maxim Defense products on Rainier Arms.